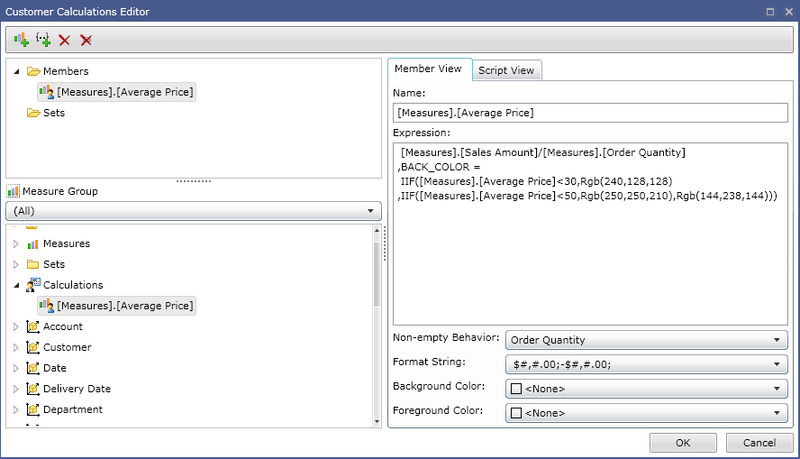 A built-in Custom Calculations Editor permits users to create calculated elements and calculated sets on their own. When creating customer calculation elements, the user can use all capabilities offered by the MDX query language (for example, MDX language functions). Creating customer calculation sets can significantly simplify the report design as customer calculation sets can take into account special features of the report (it can be complex filters or data selection algorithms). It is possible to save the settings and use them later when designing the report. One can use the following formats for the calculated indicators: formats of the shown indicator values, background colors, text colors, etc. There are special selection forms that make the selection of values easy. The query script describing the calculated indicator is generated automatically (the Script View tab). The created customer calculation elements are immediately accessible in the cube metadata tree. They are stored in the Calculations folder. One can use them as well as ordinary cube metadata when designing the report. If a property value is set manually it must not be determined using a selection form. Otherwise, it would be duplicated, resulting in an incorrect query script. In the example shown in Figure 1, property value BACK_COLOR is set manually for the calculation element, that is why the form Background Color property has value . The MDX query changes automatically after a change in the settings. The generated MDX query can be edited manually, if necessary. After the changes have been made in the designer areas, it is possible to save the MDX query design results as a named pattern in order to use it later. The results of the MDX query design can be shown using the Pivot Grid control. Hi I am new by using ranet and I want to know if I manually edit the mdx query and how to make the mdx layout changed depends on the mdx query. MDX queries depends on the settings of layout. The converse relationship is not implemented.